How to Make Budgeting Fun...Yes, it's possible! 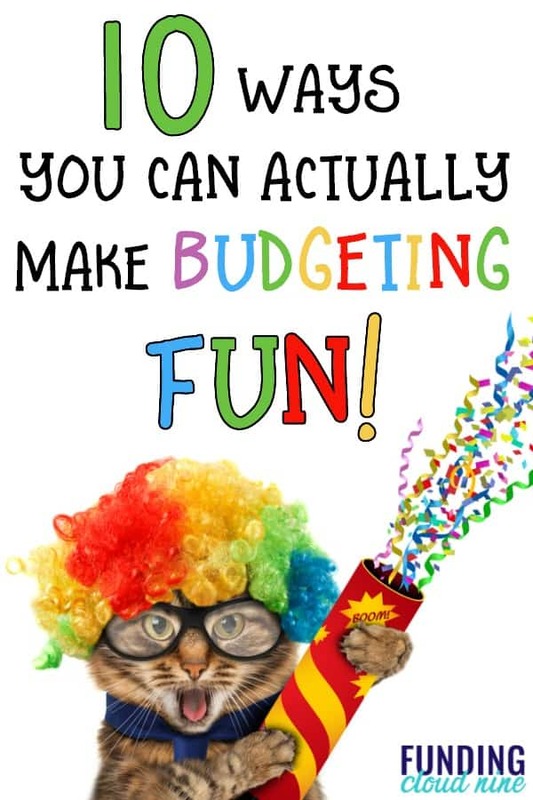 How to Make Budgeting Fun…Yes, it’s possible! Do you struggle to budget each month? Do you find budgeting boring, stressful, or even a daunting task? Well, that doesn’t have to be the case anymore! I’m here to share with you ten ways to make budgeting FUN! Can I guess what you’re thinking? Probably something like: Budgeting is not fun. That’s…ridiculous. Budgeting is a task like cleaning your kitchen or commuting to work…in other words, not enjoyable. I feel ya. Fun and budgeting are not two words that normally go together. But budgeting is a necessity for financial success. If you want to get out of debt, you need to budget. If you want to save money for something [retirement, down payment on a house, vacation, etc. ], you need to budget. If you want to stop money fights with your partner, you need to budget. Bottom line: You need to create and maintain a budget to better manage your money and reach your financial dreams. So if you need to do something, why not make it FUN?! Today I’m going to share with you ten simple ways to turn the dreaded budgeting task into a fun, motivating party (ok ok, the word party might be a stretch…). Worksheets galore! There’s lots on the internet, or you can make your own. I have three free budgeting printables that you can get if you enter your email in the box below. They are colorful, but classy (and obviously super useful for the actual act of budgeting). If you prefer rainbow, unicorn colored printables, head over to Pinterest. There are so many options and I’m sure you’ll find one you like. Grab your (free) Monthly Budget printable! 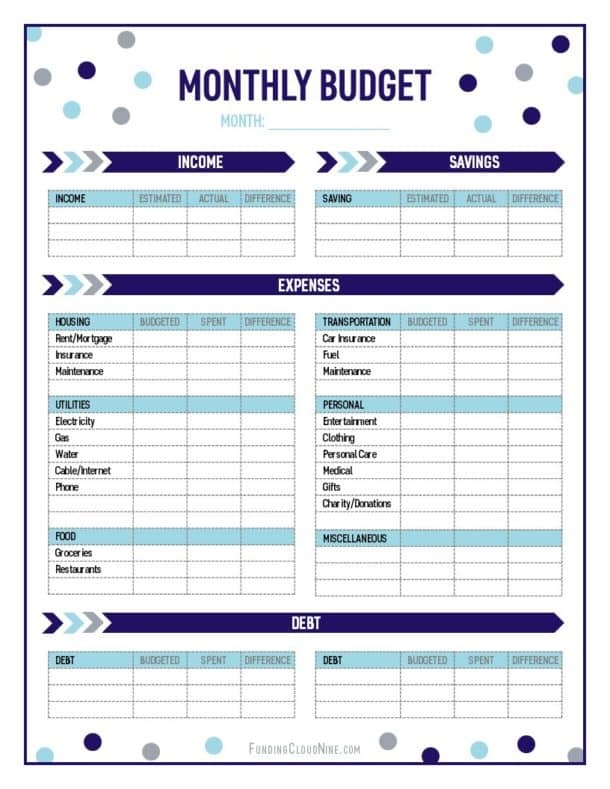 Start rocking your budget today with this Monthly Budget printable! Success! Check your email for the download. I have a tendency to complicate everything in life. I want to add detail. I want everything to be perfect. But that can be a curse when it comes to budgeting. Keeping your budget simple and easy will take the stress away from your weekly/monthly budget meeting. Something easy –> Less stressful and less time to complete –> More time for fun stuff –> Happy dance. Create a schedule for when you are going to do “budgeting stuff”. It should be the same day and time each week or month. If you are budgeting with your partner, make sure to put it on their calendar too. Organize yourself. Create a folder on your computer for all budgeting files. Create bookmarks/links in your web browser for quick access to any budgeting software, banks, credit card sites, or loan sites. Create a budget binder if you prefer pen and paper. Keep it simple. If you get overwhelmed with 100+ budgeting categories, then limit yourself to 10 or 15. More detail does not necessarily mean better budgeting. Do what works for you. Don’t try to copy someone else’s budget. Make it predicable. The fewer changes you have to make each month, the easier your budget is going to be. Try to minimize the changes you make to your budget categories each month. Determine the conditions for deserving your reward. For example, you are going to get a reward each month that you stay within your budget. Or, you are going to get a (small) reward each week that you stay under budget. Nobody likes to be told to do something. Your brain and mood automatically shift into a negative space. If you constantly read that budgeting is important and you should do it, you probably won’t have much fun in the process. But if you identify the financial goals you want to achieve, and recognize that budgeting will help you get there, you can make budgeting a much more tolerable (er, fun?) task. To start, identify a financial goal you want to achieve this month (pay an extra $100 on debt, save $1000 for an emergency fund, budget for a new workout outfit, etc.). Then sit down and figure out how you can fit your goal into this month’s budget. Continue to make monthly and yearly goals. If you go into a party thinking you are going to have a bad time, you probably will. Same goes for budgeting. If you think budgeting is going to be this awful, unpleasant task that leaves you without any money to spend, then you have the wrong mindset. Budgeting puts you in control of your money. A budget gives you permission to take vacations you’ve saved up for, to buy gifts for loved ones, to snag the dress you’ve been eying, or to even make extra debt payments to get you closer to your debt-free dream. Think of your budget and your budgeting meeting as an opportunity to take control of your life and your money. Make a budget in accordance with your dreams, goals, and values. A budget will help you get there faster. Start your budget and your budgeting meeting with a positive mindset. Related: Is Your Debt Mindset Keeping You in the Red? Cook a fancy dinner. Get dressed in a fancy dress (that you already own of course). Bring out some wine and turn on some music. Light a candle. << Actually review and update your budget >> Play a board game afterwards. Who says budgeting can’t be romantic? Perfection is the enemy. Nothing is ever perfect. Especially when you are talking about budgets. The goal is to get close. Being too harsh on yourself isn’t cool and certainly doesn’t make the budgeting experience fun. Stop punishing yourself for every little budgeting mistake or miscalculation. Just fix it, and try to get a little closer to your goal next month. There’s nothing less fun than arguing with your partner. Unfortunately, that’s how many budget meetings start…and end. Talk to your partner about your end goal. Why are you budgeting? Why is it important? Do you want to save for a vacation? Do you want to get out of debt? Do you want to buy a house? If you both know and agree on the bigger picture, you’ll start to become giddy during your budgeting meetings as you find out how much closer you are getting to reaching your goal. Math and spreadsheets can be an overwhelming stress for some right-brained readers. You can do everything on this list, and budgeting will still be a miserable experience if you are forced to manipulate numbers. Try to use a budgeting app or budgeting software to take that stress away. It can actually be fun to see real-time updates of your budget. Some of these budgeting apps are also very user friendly, have useful graphs, and make the budgeting process effortless. I personally like Mint.com, but have also heard good things about YNAB and EveryDollar. Everything is more fun with friends, right? Join a budgeting Facebook group or wrangle some friends together to talk money. You’ll be surprised at how a typically boring task can be turned into fun with the help of a few friends. The secret ingredient to successful budgeting is pretty simple: be consistent. I think making tasks fun, even if you have to be creative or fake it a little, will help you stay consistent. That’s why I’ve written this post on how to make budgeting fun! Even if you have a high spending month, or don’t have much time to spare, or are simply worried about bills, make an effort each month to create a budget. At the end of the month, make sure to evaluate how you did. You can’t just make a budget and neglect to see how your actual spending compared to how much you budgeted. Budgeting doesn’t have to be hard, or stressful, or boring. You can make it fun! Do you find budgeting boring? How have you made budgeting fun?